It's only spring but the temperatures and pest season are already heating up, scorpion sightings are on the rise. TUCSON, Ariz. — It's only spring but the temperatures and pest season are already heating up, scorpion sightings are on the rise. Brian Harper knows all about scorpions, he's an inspector for Truly Nolen. He says the company receives more than 40 calls a day for scorpion removal.So what's the best way to deal with them? Harper says homeowners should identify the voids in their homes and seal off doors, screens and other areas they could crawl through. "That's where the scorpions come from, that's the place to really build up a good barrier, so that the scorpions could have something to run into before they actually get to the structure," Harper said. If these nocturnal arachnids find a way in to your home, Harper says they'll be looking for wet towels or other dark areas to hide. "Have a clutter free environment," Harper said. "Obviously where there is clutter there's the capability all things including scorpions to nest inside their home." 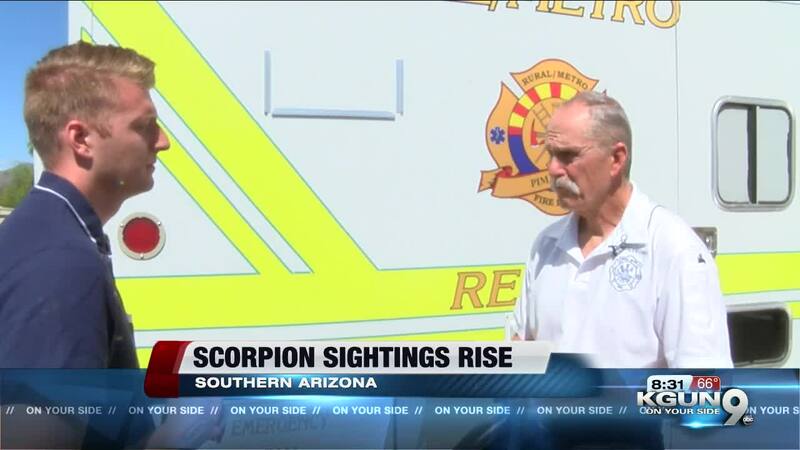 Rural Metro Battalion Fire Chief John Walka and his crew respond to emergency calls on scorpion stings. He says for children 10 and younger, adults 60 and over, the venom injected could be deadly. Walka says it's important to remain stable, calm and wait for first responders to take you to the emergency room. "If you have difficulty breathing, any kind of muscle twitching, eye movements, nausea, vomiting, any of these things can be serious," Walka said. "If you have any of these symptoms you do need to get medical care immediately." A scorpion can stay in the same spot for months without moving, both Harper and Walka say a good word of advice don't put your hands where you can't see.